Factbox: Who Was Martin Luther King Jr? FILE - Dr. Martin Luther King, Jr. is seen here with Rev. Jesse Jackson (L) just prior to his final public appearance to address striking Memphis sanitation workers, April 4, 1968. Martin Luther King Jr., a man who embodied the U.S. civil rights movement, was assassinated 50 years ago on April 4, 1968. Here are some key facts about his life. Martin Luther King Jr. was born on January 15, 1929, in Atlanta, Georgia. He was the son of Martin Luther King Sr., a prominent local preacher and civil rights leader, and Alberta King, a former schoolteacher. King says he first became conscious of racism at age 6, when a white friend's father prohibited his son from playing with him. FILE - The Rev. Ralph Abernathy (L), Rev. 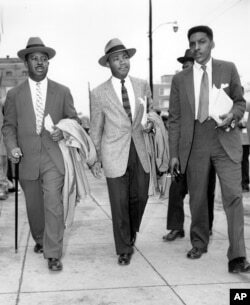 Dr. Martin Luther King, Jr. (C), and Bayard Rustin, leaders in the racial bus boycott in Montgomery, Ala., leave the Montgomery County Courthouse on Feb. 24, 1956. King rose to prominence in the mid-1950s when as a young preacher he led the successful drive to desegregate public buses in Montgomery, Alabama, forcing the city to end its practice of segregating black passengers. He organized protests throughout the 1950s and 1960s against Southern segregation, the struggle for black equality and voting rights. FILE - Tear gas fumes fill the air as state troopers, ordered by Gov. George Wallace, break up a demonstration march in Selma, Ala., on what is known as Bloody Sunday on March 7, 1965. King understood a key to success for the civil rights movement was a strategy of nonviolent protests, which he championed as an alternative to armed uprising. King has said he was inspired by the teachings of Indian leader Mahatma Gandhi. 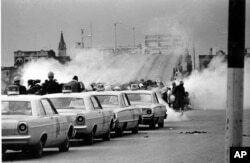 The movement was tested in places like Birmingham, Alabama, where police used attack dogs and fire hoses to disperse protesting school children and in Selma, Alabama, where a 1965 march is remembered as "Bloody Sunday" because police attacked protesters. FILE - Dr. Martin Luther King Jr. acknowledged the crowd at the Lincoln Memorial for his "I Have a Dream" speech during the March on Washington, Aug. 28, 1963. King's famous "I Have a Dream" speech launched what had been a mostly black Southern movement into a nationwide civil rights campaign. By August 1963, the push for equality had grown significantly across the country and 250,000 people, both black and white, traveled to the nation's capital to participate in the March on Washington. The protest was peaceful with no arrests. The civil rights movement came to a crescendo in 1964, when President Lyndon Johnson signed the Civil Rights Act outlawing racial segregation in public places and King won the Nobel Peace Prize. The following year, the Voting Rights Act banned practices that were used to keep blacks from participating in elections. FILE - The Rev. 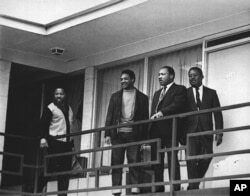 Martin Luther King Jr. stands with other civil rights leaders on the balcony of the Lorraine Motel in Memphis, Tenn., a day before he was assassinated at approximately the same place, April 3, 1968. On April 4, 1968, a single gunshot killed King on a motel balcony in Memphis, Tennessee, where he was supporting striking sanitation workers. James Earl Ray, a segregationist, pleaded guilty to shooting King and spent the rest of his life in prison. 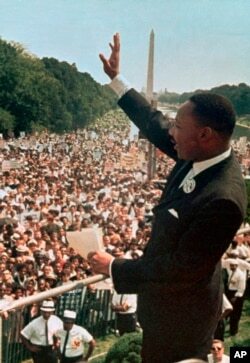 King, who was 39 years old when he died, gave a speech the night before his death that foreshadowed his assassination. "And I have seen the Promised Land. I may not get there with you, but I want you to know tonight that we as a people will get there," he said.